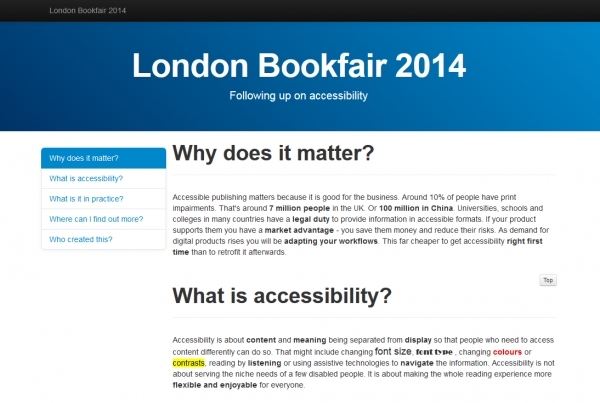 Alistair McNaught was working with the Right to Read Alliance at the London International Bookfair in April, supporting two accessibility events. We wanted people to have something they could take away with them that would give them an instant overview of accessibility issues in publishing but still point them to detailed information. The Xerte toolkit website template (sometimes called the Bootstrap template) proved the ideal solution. By creating the learning object and linking the URL to a QR code delegates at the Bookfair could instantly scan the QR code on the handouts and explore the information on their phones. Used pagetypes: On the Website (Bootstrap) Template this used Section pages, Navigator pages, Text and Image pages. How this LO add value for my learners? : Easy to provide people with an instant overview of complex topics AND it works beautifully on mobile phones.